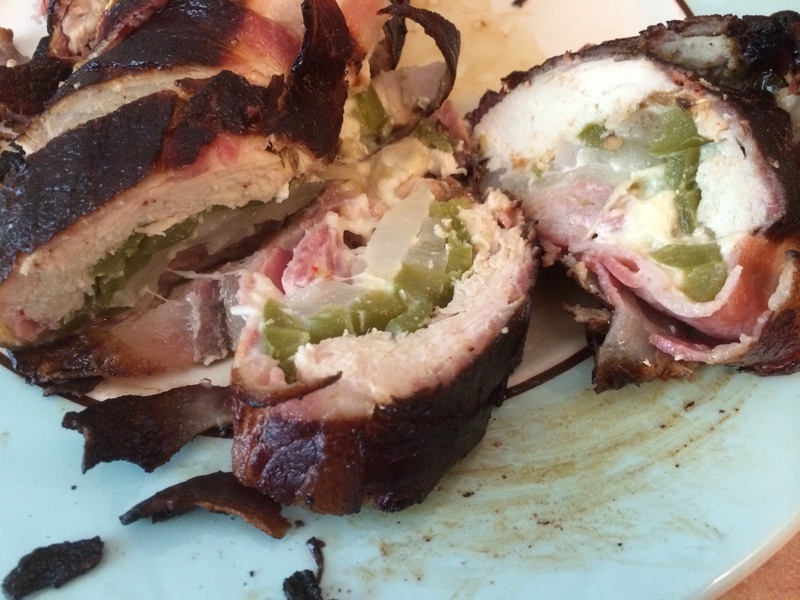 A few weeks back, the St. Louis Post-Dispatch reported that SugarFire Smokehouse had placed in Memphis In May for some kind of smoked chicken bacon cheesy sushi dish. I gave it a shot a couple weeks ago on vacation as an appetizer for our fajita night, and we were met with rave reviews. 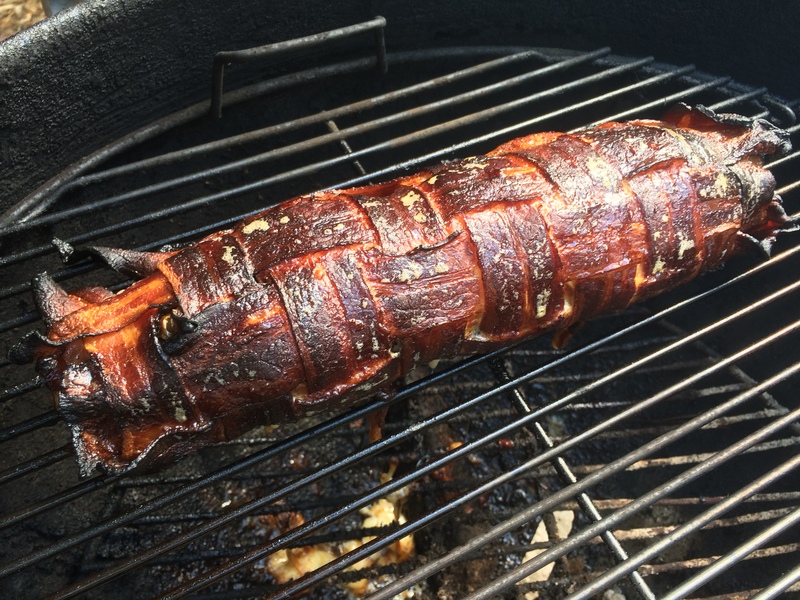 The wife told me to “take it easy” and “not go crazy” on the BBQ this 4th of July, so I made fresh salsa, grilled a bunch of gourmet sausages, and made the smoked chicken bacon cheesy fajita wrap for my extended family. 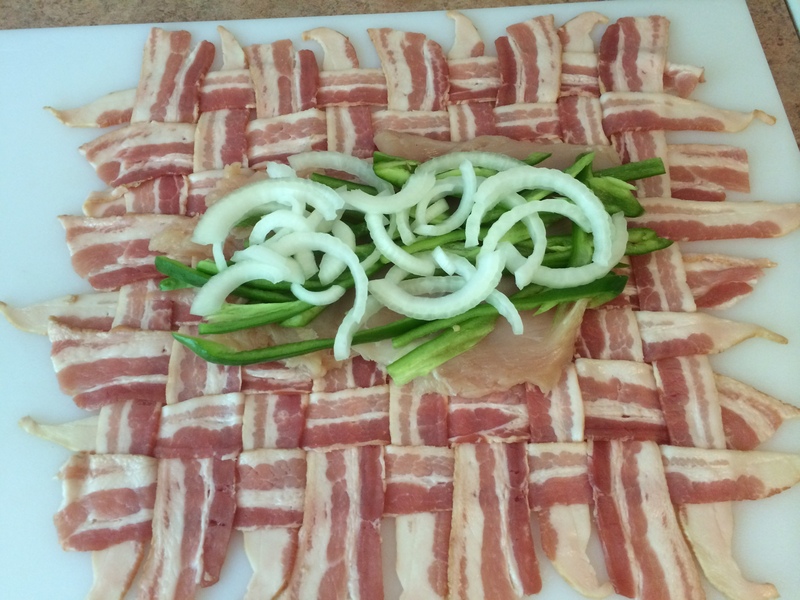 Step one is the bacon weave, this time a full pound of Tyson pork bacon (since it was on an insane sale of $2.99 for a 1 lb. pack), hosting at its center a pounded-flat boneless skinless chicken breast (this one being a little over 1o ounces). On that went a washed, seeded, and thinly sliced Anaheim pepper, and a quarter of a sweet yellow (Vidalia) onion, cut into liberal long slices. And on top of all THAT went some pulled mozzarella string cheese (two sticks) and a couple slices of pepper jack. I didn’t want too much heat, since a variety of people would be eating this – including a couple people who aren’t down with the hot peppers. 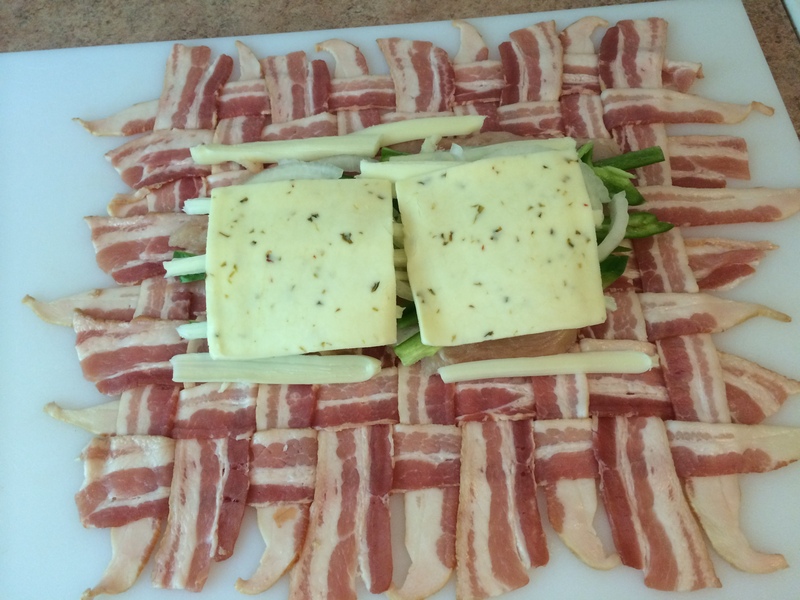 When wrapping this contraption, I pulled the bacon edges nearest to me into the center of the cheese slices and then rolled the whole thing forward. 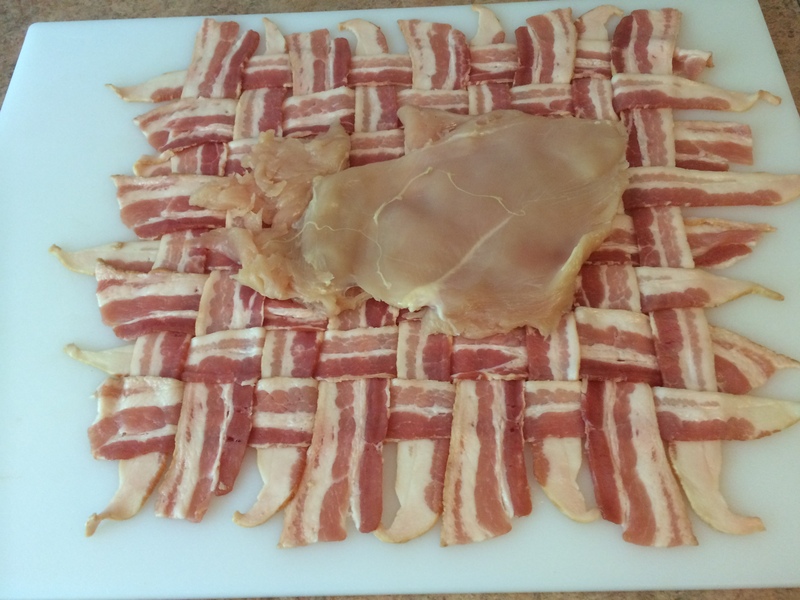 This may allow the cheese to slide around two sides of the bacon. I didn’t bother closing up the edges since they went so far beyond the ends of the chicken and other contents. 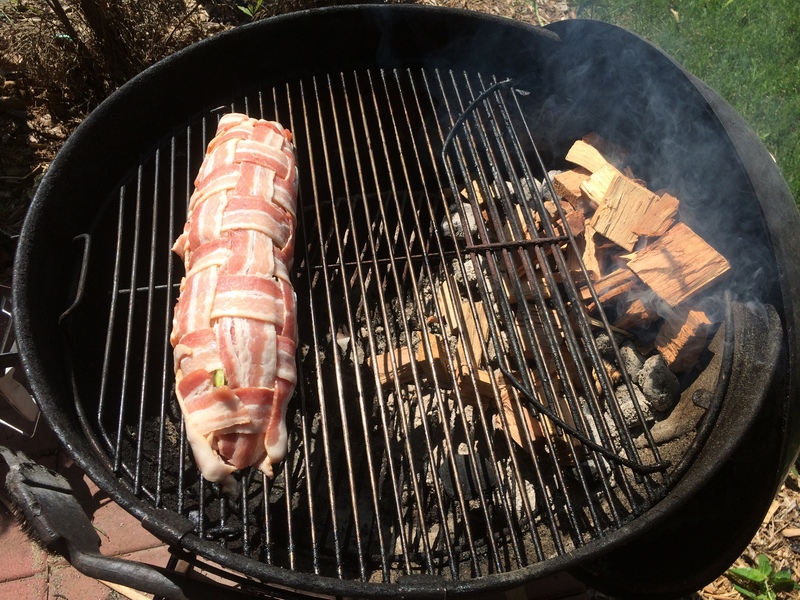 My weave / wrap went onto a Weber 22″ set up for indirect smoking with large hickory chunks. While this smoked, I drank some amazing beers that I muled back from Florida. That we can buy neither Oskar Blues nor Dogfish Head in St. Louis is ridiculous. After 45 minutes, I rolled it over. 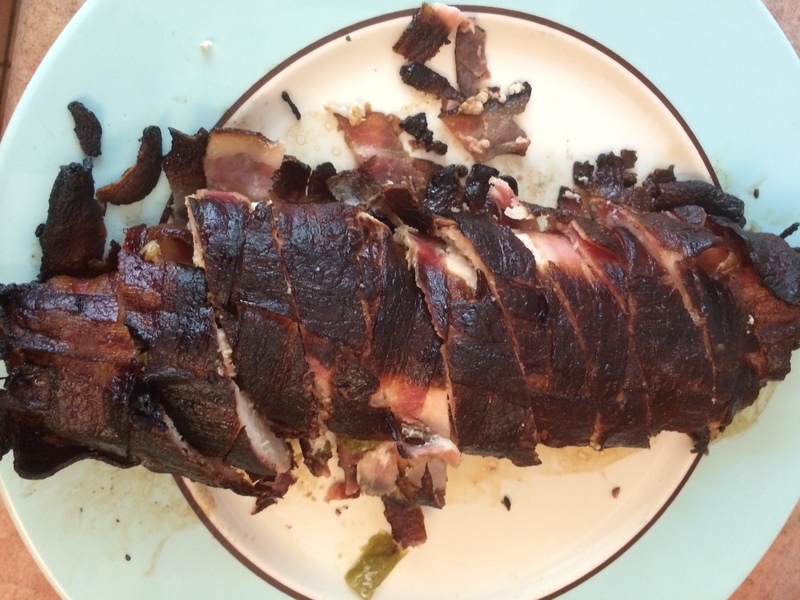 After barely over an hour, it was fully smoked. Importantly, the digital temperature probe read well over 165 in all locations that I tested. It’s ready to rest. After about 10 minutes of resting, I sliced it at an angle and rang the appetizer bell. Cleaning up the scraps of smoked crispy bacon was hard work. I barely hat time to get pictures. 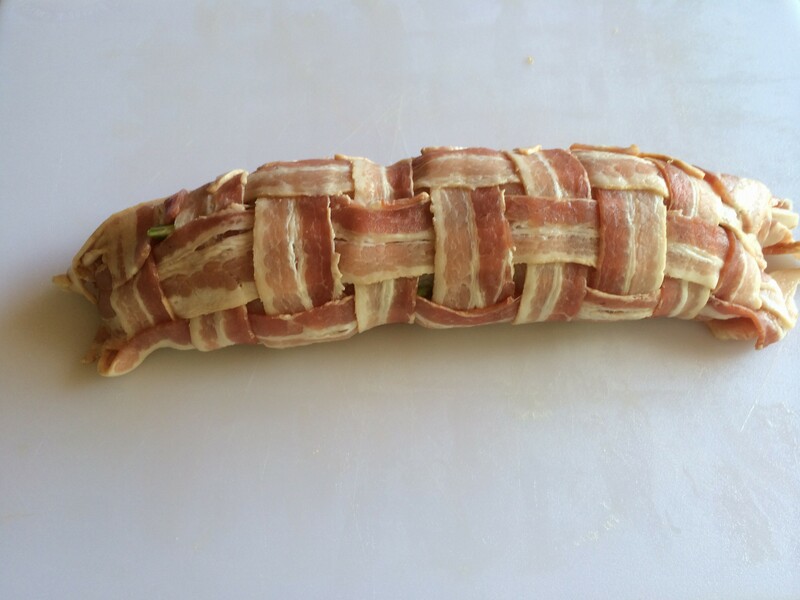 If you make this, here’s a tip: In addition to getting a center piece, make sure you also get one of the ends. It’s more bacony than cheesy, and it’s gluttonous. Everyone who had it loved it, and I offer my sincere thanks to SugarFire for inspiring this slight variation on their idea. Make this – you’ll not regret it. 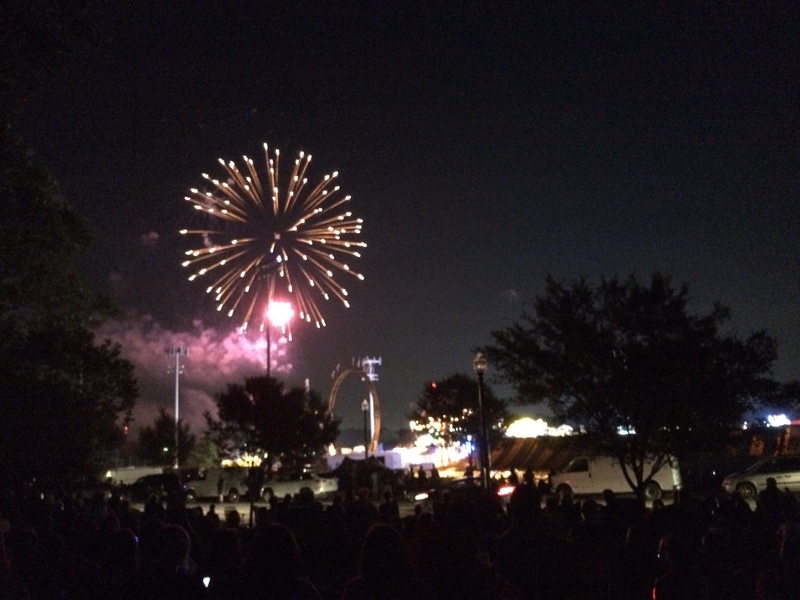 I hope you had a wonderful and save Independence Day, full of beers, meat, family, and fireworks. Hey there…. You can get Dogfish Head in the Metro East, I go to Randall’s in Fairview Heights but any gas station / store could have it. There is red roof liquor in Columbia Illinois right over the JB Bridge. You might also be able to get the Oskar Blues at Randall’s if Illinois is an approved state. My man Craig… what it is, what it is. I’ve heard that you need to head a little east to get Dogfish Head, but didn’t realize it was that close. You’ve got to give me a call sometime. Nice. This should be illegal. I am calling the cops! ;) Next time, maybe catch those wonderful drippings with a pan and use to season some baked beans. You wont regret it. BTW if you’re ever in the Springfield, Missouri area, you should check out Mother’s Brewery.